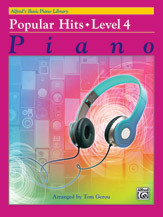 Alfred's Basic Piano Library: Popular Hits offers Broadway, pop, and movie music arrangements to be used as supplementary pieces for students. Soon after beginning piano study, students can play attractive versions of favorite classics, as well as the best-known popular music of today. This book is correlated page by page with Alfred's Basic Piano Library: Lesson Book 4. When pieces from the Popular Hits book are assigned in conjunction with the material in the Lesson Book, new concepts are reinforced in a fun and motivating way, increasing the student's interest in piano study.Titles: Big Yellow Taxi (Joni Mitchell) * Downton Abbey Theme (from Downton Abbey) * Firework (Katy Perry) * How Far I'll Go (from Walt Disney Pictures' Moana) * Jacob's Bakery (from Fantastic Beasts and Where to Find Them) * The Magnificent Seven (from The Magnificent Seven) * Mia & Sebastian's Theme (from La La Land) * Newt Says Goodbye to Tina (from Fantastic Beasts and Where to Find Them) * The Pink Panther (from The Pink Panther) * Sorry (Justin Bieber) * Star Wars (Main Theme) (from Star Wars: The Force Begins) * Style (Taylor Swift) * You'll Be Back (from Hamilton).